Laurier’s Lazaridis School of Business & Economics came home with some serious hardware after competing at the 2016 DECA U Provincials on Jan. 15-16. The hard work paid off at the end of the weekend for the Lazaridis School team as their honours included the Largest Chapter Award, second place in trivia-based Quiz Bowl and the Highest Medal Count — a grand total of 29 medals. After dedicating hours and hours of practice and preparation over the past four months, the Lazaridis School team participated in a mix of individual and team events ranging from accounting and financial services to management consulting. They were among 18 other universities across Ontario in attendance, including Queens, Western, Toronto and Ryerson. DECA is a case-centric business conference that challenges students' ability to think on their feet and creatively solve problems. Students are given only 15 minutes to read and prepare their case for the judges. Delegates then have to write a written test that assesses their knowledge of business terms, theories and concepts. 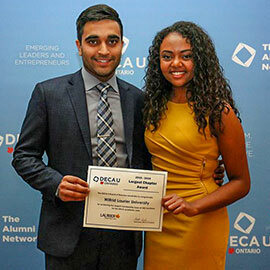 The Lazaridis School’s 121-member student team was led by DECA Laurier co-presidents Ash Kaura and Winta Yonathan, who have a combined seven years of experience with the team. These events included an alumni panel, workshops to develop their case skills, and a mentorship program connecting new and experienced delegates. Any of the Lazaridis School’s 29 individual and team medal recipients has qualified to compete at the 2016 DECA Internationals in Washington, D.C. on April 23-26, though their attendance will be based on personal exam schedules and being able to afford the associated costs. The team will be hosting a conference on March 5 which is open to all 365 members of the DECA Laurier chapter. They have also invited other universities across Ontario to participate.